Salman Khan’s most anticipated movie of the year Bharat is all set to storm the box-office. The makers are not leaving any stone unturned when it comes to the promotions of the film and creating excitement among the fans. The first teaser look of Salman in Bharat is unveiled today and is already creating a buzz. The actor took to his social media handles to share one of his looks from the film in a salt-and-pepper avatar. And we are absolutely in love with the grey-haired Salman! We Cannot Take Our Eyes Off From Salman Khan aka Bharat Dressed in a Off-White Kurta Pajama (See Pic). Not only is the poster compelling, but also its caption. It is no secret that Bhaijaan knows how to have fun and has had a “colourful” life, as claimed by him. Salman Khan and Katrina Kaif’s Bharat Trailer Finds Its Way Into Marvel’s Avengers: EndGame – Read Deets. 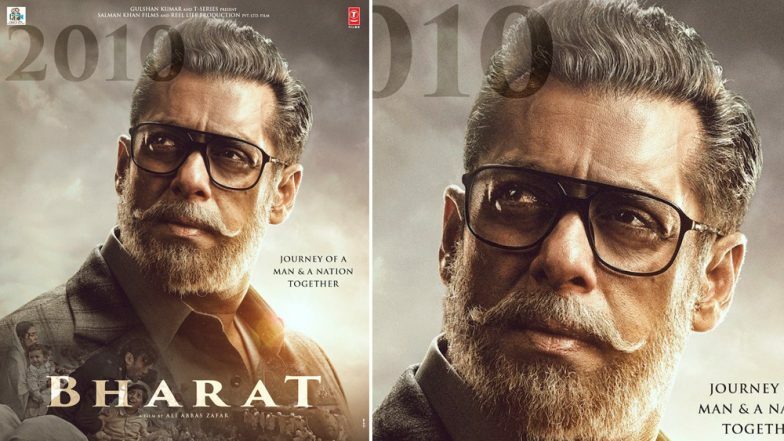 Talking about Bharat, Salman will be seen essaying the eponymous role. Helmed by Ali Abbas Zafar, the film is reportedly based on the successful Korean film, An Ode To My Father. The movie stars Katrina Kaif opposite Salman, with Tabu, Disha Patani, Sunil Grover as the supporting cast. The movie is slated to hit the theatre on June 5.